Two things: First, my skills as a food photographer have not yet improved. I probably should have wiped the food specks from the rim of the bowl if I wanted to make this look aesthetically appealing. And the second thing is that I now realize these recipes are written for people with more cooking experience than I have. 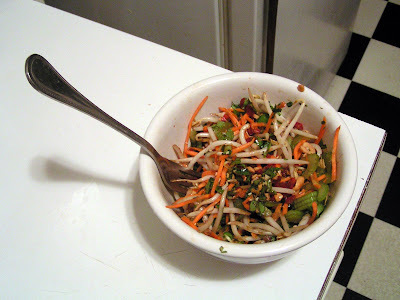 Take last night’s recipe, for example: what the 101 salads article terms Sichuan slaw. Notice that the recipe doesn’t specify what quantities of these ingredients should be used. On one hand, I suppose it doesn’t matter; this is a salad, after all, and as long as I don’t have my vegetable chunks floating like boats in a sea of soy sauce, I’m doing okay. Still, I don’t trust my culinary instincts, which I feel in this case steered me wrong. I’d never diced a chili before or even bought a pepper that wasn’t a bell or jalapeno. Not knowing if I had purchased the mouth-scorching varieties, I stripped the seeds out. End result: a fairly un-peppery salad in spite of the chili pepper I put into it. I also threw in too many peanuts and, in a climactic act of ignorance toward the directions, mixed all of it together — base salad in addition to the nuts and herbs that were meant to be the topping. Again, I remind myself that this is a salad and therefore it leaves more room for error and experimentation that, say, a pastry, but I still would have liked to know what the final product would have tasted like had I followed the directions more closely. In the end, it wasn’t bad. It also wasn’t amazing. Truth be told, I’m not the biggest fan of either slaw or soy sauce-based dressing. I picked this one based on the final suggestion that it comes out best when you use basil, mint and cilantro, and I knew my house magically contained all three ingredients today. So, really, the fact that I liked this at all is pretty remarkable. And I did like it — but just maybe that’s the case because I made this salad and therefore could only see it through a parent’s eyes. And then I ate it. Fucked up, I know. I'm kind of hating on you right now for doing some food writing. And jealous that you write several times a day. :p But in other news, the salad looks tasty. 1. Sichuan is actually closer to the correct pronunciation, as people have a tendency to pronounce Szechuan as "Says-WON" or "Sesh-WON." The other spelling gets it a little closer with "Sitch-WON." Although to answer your actual question, I have no idea when this preference change happened, either. And I work in Chinatown, so I like to pretend I'd have noticed that kind of thing. 2. Gordon Ramsay would hate that dirty bowl. 3. I admire your commitment to the art of the salad. I will peruse here for salad recommendations, and I'm happy to send you some that I like if you're interested. If I had to make it, I would have used three parts (at least) sprouts to one part each carrots and celery, the reason being that sprouts taste better to me, and from what I recall are more apt to not fight the dressing, where carrots would. I'm just biased against celery. 2 parts oil to one part soy sauce sounds about right, or as right as its likely to get. I'm still wrapping my mind around a dressing that isn't in some way a vinaigrette, though I've made them before. I definitely would have mixed the dressing separate form the salad before hand, *then* tossed it all together, but that's just so I could tinker with the amount of chili and soy sauce. Also, in case I got it right, so I could save the extra dressing and serve it the next day on maybe red cabbage or pre-cooked chicken. A sprinkling of nuts and the herbs as topping would have suited me. Not sure if this is on the list, but my aunt brought to our Easter gathering a spinach salad with a few basil leaves, sliced strawberries, sliced almonds, and raspberry vinaigrette. The strawberries and almonds were both sparing, maybe 1 part of both to five parts of the spinach, so that every mouthful had a a taste of each, but no more than that. I passed over the pulled pork and hamburgers for thirds of that salad.